As the new session of Congress opens, Iowa Senator Chuck Grassley anticipates one of his first orders of business will be the nomination of Senator Jeff Sessions of Alabama as the new Attorney General. Grassley expects two days of hearings on Sessions next week followed by a likely floor vote on his confirmation right after President-elect Donald Trump’s inauguration. A list of 21 names of likely Supreme Court nominees is circulating and Grassley says he’s already been studying the list carefully. Grassley, a Republican, endured much grief during 2016 for refusing to hold hearings on President Obama’s nominee for the high court. Grassley says his list of priorities for legislation he’d like to see approved in 2017 includes several familiar items from 2016 and some that are much older. “First of all, sentencing reform, juvenile justice reform. 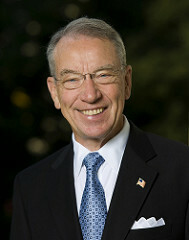 Those are two things left over from last session,” Grassley says. “There’s been a lot of talk about a constitutional amendment for a balanced budget and that’s always been an interest of mine. We haven’t had a chance to vote on that for probably 15 or 20 years.” Immigration reform will also be in the forefront, he says. While Republicans will soon control both the U.S. House, Senate and the White House, Grassley knows it won’t be a cake walk for his party. He says it will require much cooperation between Democrats and Republicans to get things through the Senate. The GOP holds a 54-to-44 majority over Democrats in the Senate, with two Independents.